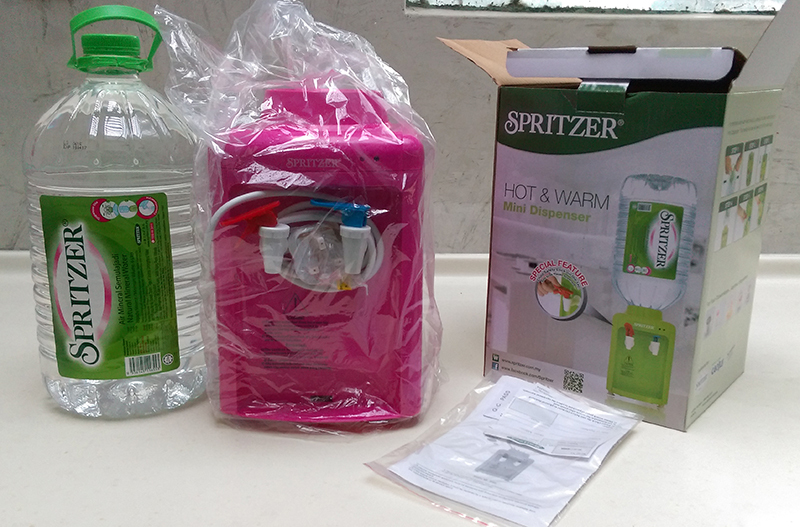 Plus Size Kitten: Spritzer Hot & Warm Water Dispenser Giveaway! 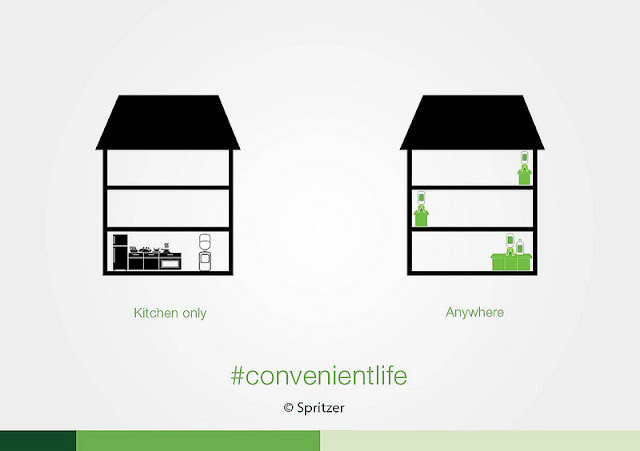 say hello to my convenient life! Working from home is never easy. Who says it is! There's no time frame to when work stops and it feels like I am on standby 24/7. Sometimes I even forget to take a break or go for lunch. There's when a hot and warm dispenser would come in handy. I could make tea or coffee in a matter of seconds and enjoy a biscuit. 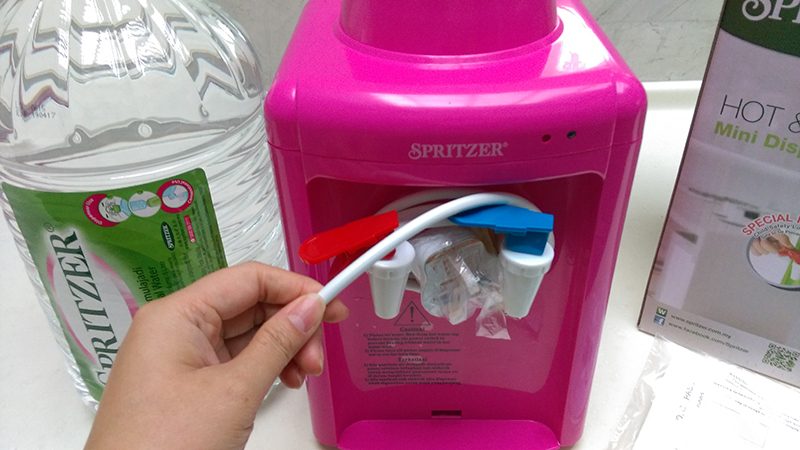 I don't have the time to boil water, so the Spritzer Hot & Warm Mini Dispenser came just in time to make my life convenient. 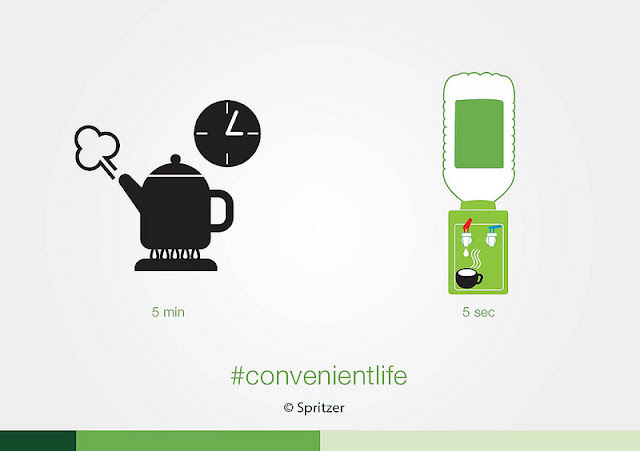 It takes only 5 secs to get started to dispense hot water. How cool is that?. just plug & playand it's ready! 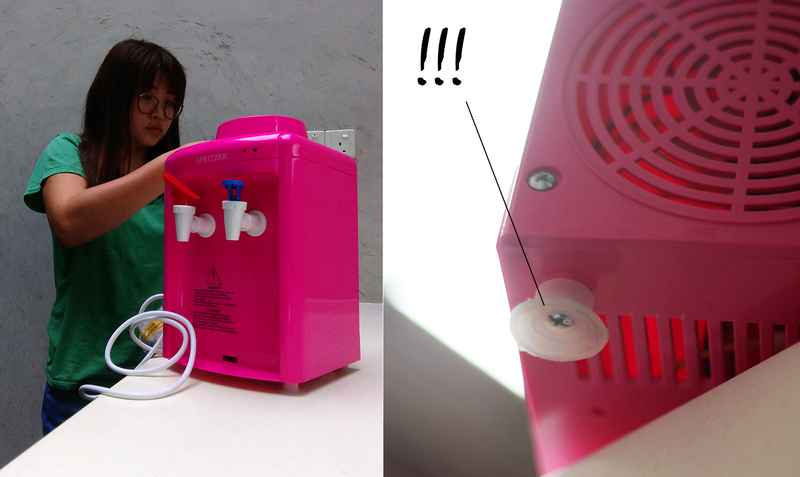 I have the basic mini water dispenser (MWD) and the difference between the Hot & Warm water dispenser is that the basic MWD one doesn't come with the two water temperature option and the table lock (sucker). The table lock keeps the MWD in place. It was annoyingly hard to position it as the sucker (bottom) is strong!!! It gives a pop when I successfully pry it off it's place. I think this feature deserves a mention :) especially in homes with children. Don't want to knock it down and damage the MWD. It isn't actually industrial made for professional use. It's made to be portable, lightweight and convenient for those on the go. No delivery hassle, no deposits required (available only in the Klang Valley area). 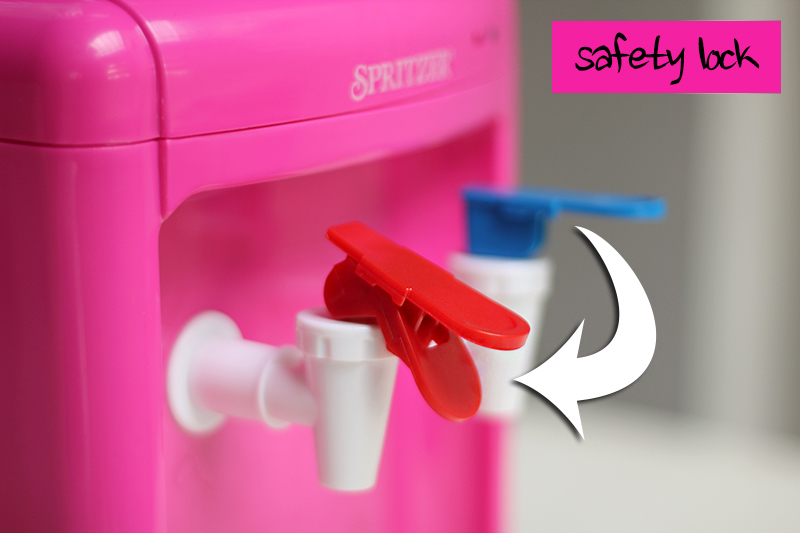 The bottles are designed to fit nicely on all types of water dispensers. The bottles are light-weight and ecological friendly. Easy handling, as it does not require too much man efforts to carry the bottle. Tip: The water bottles are lightweight, eco-friendly and recyclable. portable - you can place it anywhere in your home! 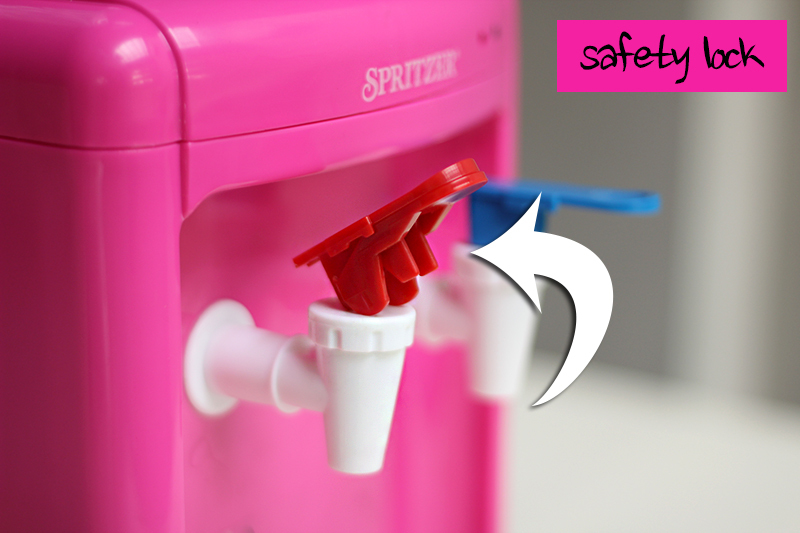 You won't know I'm telling the truth until you win one (1) Spritzer Hot & Warm water dispenser from my giveaway today! It's real easy, just leave a comment today with your name, e-mail and answer this question "which website can you buy this online?". 1. Open to readers residing in Malaysia only. 2. Giveaway starts today for 24 hours only. 3. 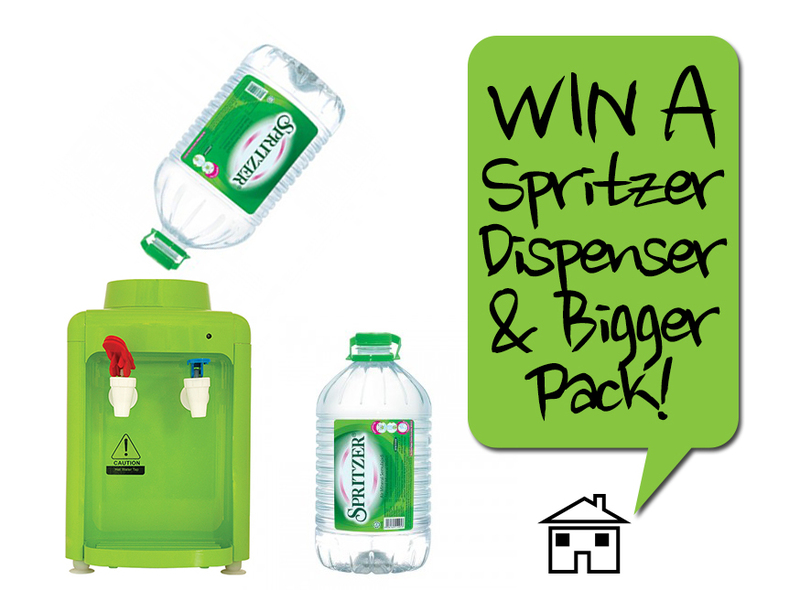 Your prize will be delivered to you by Spritzer Malaysia. Thanks for the giveaway Tammy! This is a great opportunity since my rental house doesnt have kettle and I have to constantly boil water in a pot and scoop it out using a ladle. I feel so traditional already XD hope that I can get lucky! Answer: Of course you can but one from http://www.spritzer.com.my . Thanking you in advance, Mamasan. If I had this,waking up in the middle of the night to make milk will be a breeze! I am no good in making beautiful quote or description. All I want to is just win the spritzer lols. Okay bye. OMG OMG I want this so badly, so convenient as it can make our life so much easier! I need this so badly ! staying in a rented place & boiling water , waiting for it to cool down is so tiring :/ sometimes i dont get enough water intake & my skin gets so dehydrated. I am moving to new condo next month, this will be so useful to me! I would love have this without having trouble to boil water to made milk for my two little kids. And with more time to spare for them. Such an aWeSoMe gIVeaWay Tammy !! 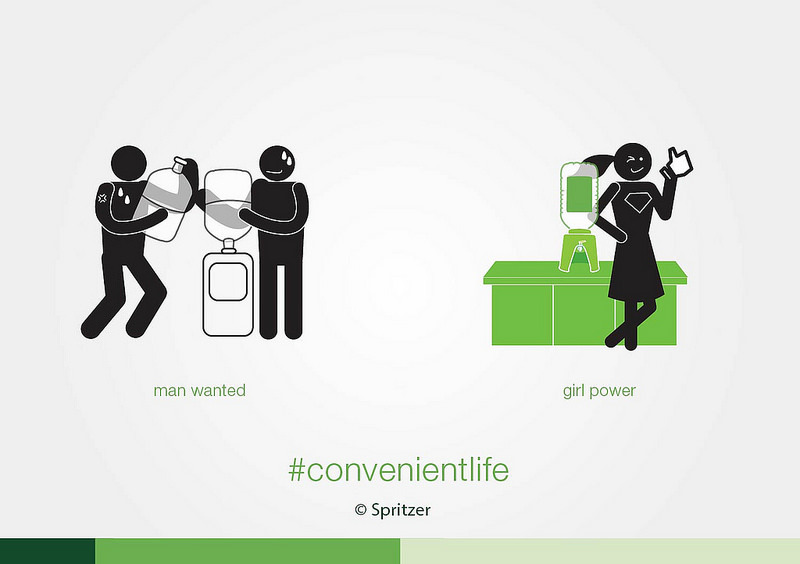 Love Spritzer & Live a Convenient Life Now ^^!! Omg it's so cute I want 1! I don't know why but I really need it for some reason :) Hope I win! This Spritzer water dispenser is really good. Hope to win one to put upstairs so my children can take water to drink easily without going downstairs to the kitchen. Thanks for the giveaway Mamasan! With this dispenser, coffee is a breeze away! THANK YOU SPRITZER GIVE US AN OPPORTUNITY TO WIN THE DISPENSER. Hope I can win this and use it during raya time. Hooray! Great Giveaway...Many thanks Tammy! 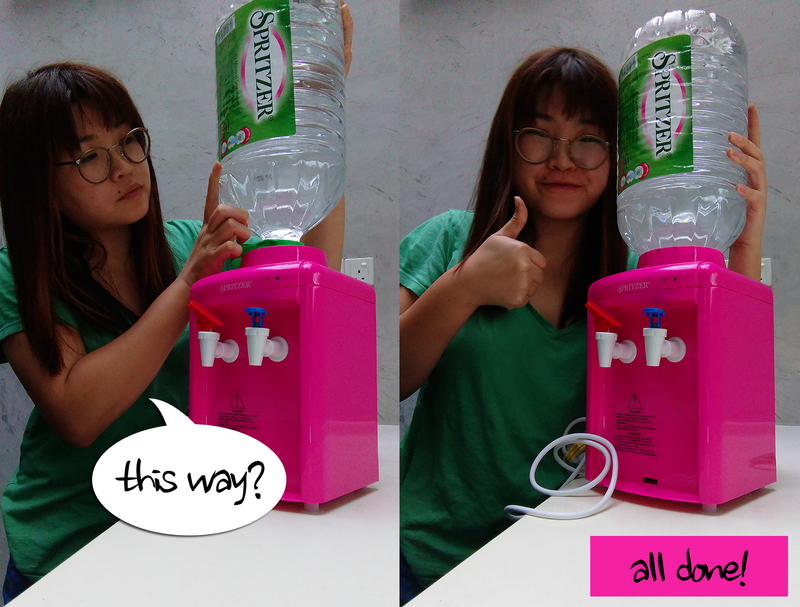 What a cute water dispenser to start your day. When too busy to boil water, this Spritzer Warm and Hot water dispenser definitely would become my day savior!! 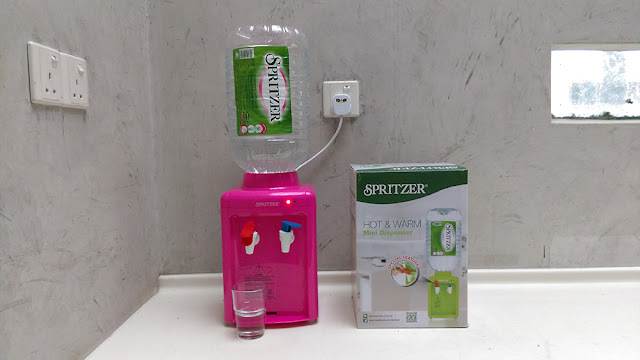 Thx Spritzer and Thx Tammy.. Been eyeing for this Spritzer Hot & Warm Dispenser for a while now and I hope I am the lucky ones to win this..
OH I SO NEED THIS AS I STAY IN A ROOM ALL DAY LONG N DUN GO OUT TO THE KITCHEN! 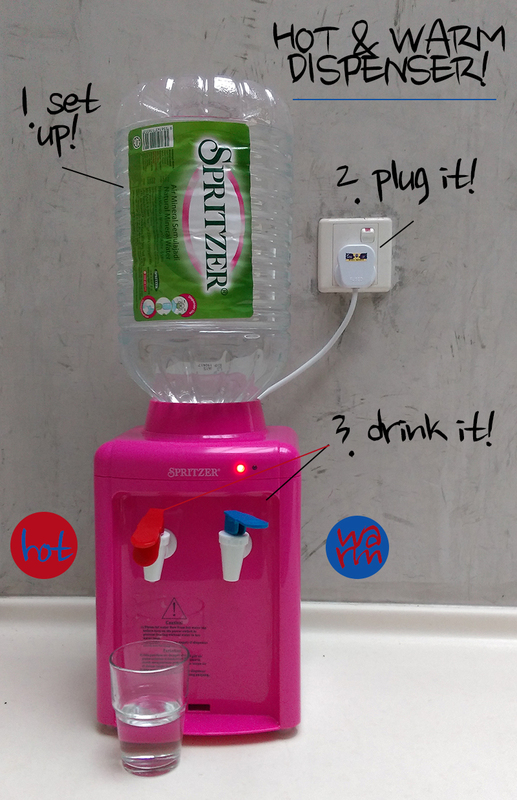 Answer : We can get Spritzer water dispenser at http://www.spritzer.com.my! Having Spritzer hot and warm water dispenser at home would be a great way of example-setting and cultivating a healthier habit to the whole family especially with kids. 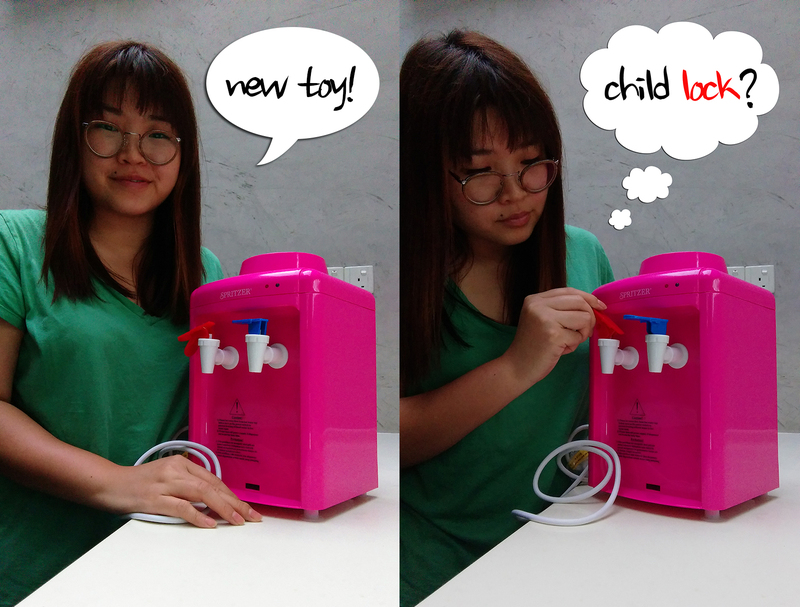 Its stunning colour, & simple faucet system, would be a fun encouraging experience for kids. To ditch sweet sugary drinks and to meet daily fluid quota will now be a breeze and hey, milk-making in the middle of tiresome sleepy night, piece of cake! I might be too late. Anyway, just to support you.